The Grey Rose Building was constructed prior to 1883 and housed a succession of businesses until 1938, when the Gray Rose era began. In that year, a new storefront of Vitrolite and glass brick was installed for the Gray Rose Beauty Shop. In 1947, the façade and interior were further remodeled, with the front two-thirds of the building occupied by women’s apparel and the rear one-third devoted to the beauty salon. Earle A. Deits was the architect for the remodeling, which included a two-story glass front with a second story mannequin display. 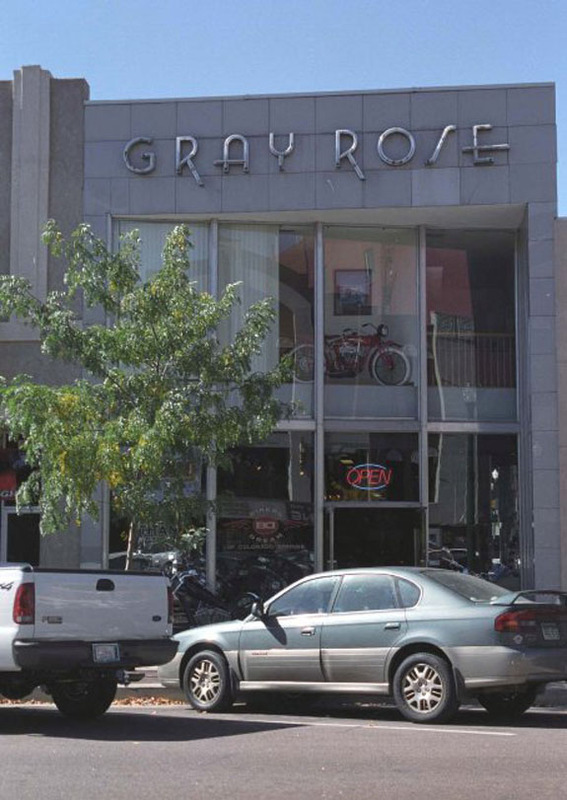 The Grey Rose Building is significant as an example of Modern specialty store architecture in Colorado Springs, as reflected in its sleek façade, lack of ornamentation and inset angled display windows and entrance, its innovative use of Vitrolite panels, and its distinctive store name depicted in raised metal with neon backlighting. The building is also significant in the field of commerce for the elegant, sophisticated, and forward-looking method of merchandising and presenting women’s fashions – the creation of a “shopping experience” – employed by the Gray Rose apparel shop in the immediate post-World War II period.